Please register for this No Cost Event so we can get a headcount. Come and go anytime during the weekend as time and weather permit. Read on for details. 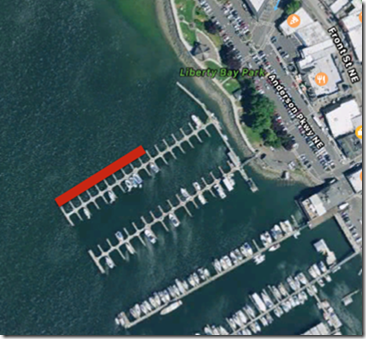 Poulsbo has worked out a new dock plan that will be implemented over the next year or two having a large length of dock without pilings just for seaplane traffic. So long to the small dock at Poulsbo. This year they are moving about 200’ of float space just to accommodate floatplanes for a weekend in May. The plan pictured below will moor two large floats (red) to the ends of existing docks. The temporary dock plan in the photo is about 200’ in length and the floats are just over 12’ wide. The pilings they will be tied to are 28-30 feet apart and will not be tied hard and fast since they have to float with the tide, so add another foot or so since they are planning to have tires too for your float’s protection. The town and port are bending over backwards to welcome seaplanes for the entire weekend. Free moorage for the night if you choose to stay and lots of restaurants and shops if you just plan to come for the day. Take a mom to lunch or shopping in Poulsbo for Mother’s Day! Hope to see you there. Better yet, have her fly there. PS The message below is from Jannese Hunt, Poulsbo Guest Services Coordinator. My job at the Marina is to ensure that you and everyone that visits the Poulsbo Marina has a fantastic experience. I am working on providing you with contact information for lodging packages and transportation.